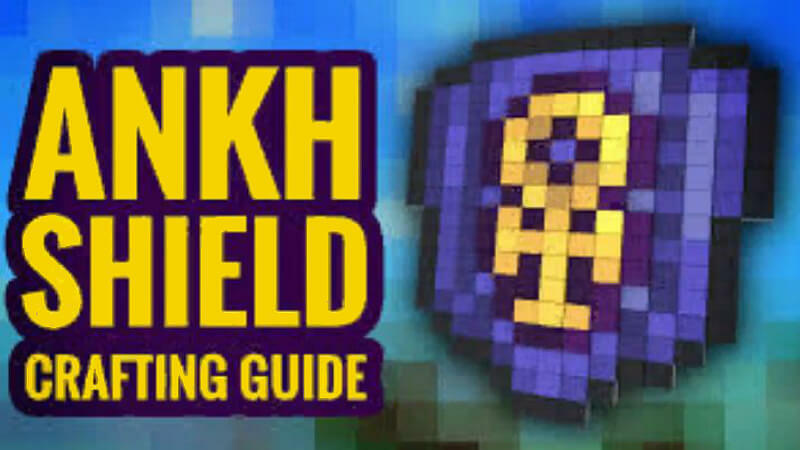 The Ankh Shield is one of the best equipment items in the game, making you immune to knockback, fire blocks, and most debuffs. It’s also one of the most complicated items, and although you can get it before even fighting the mechanical bosses, you probably won’t have it until you’ve already killed Golem, or maybe even the Moon Lord. 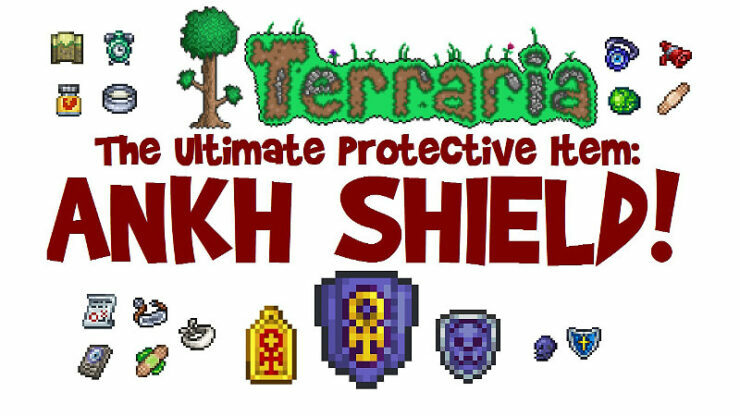 Although the Ankh Shield won’t be obtainable until Hardmode, you can still get a few of its components before Gardmode. Obsidian Skull: This ingredient is the easiest to obtain. Craft it with 20 obsidian at a furnace. Obsidian can be obtained by pouring water on lava or vice versa. Cobalt Shield: You can find the Cobalt Shield inside chests throughout the Dungeon, and you’ll probably find more than you need. Nazar: This item has a 1% chance (2% in expert mode) to drop from Cursed Skulls in the Dungeon. I recommend getting this one before fighting Plantera, as Cursed Skulls are more scarce in the post-Plantera Dungeon. 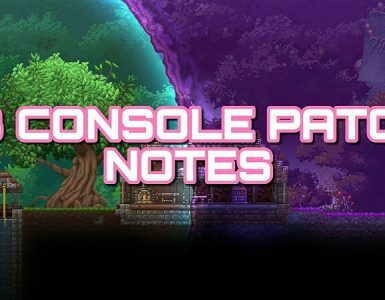 It also drops from the Cursed Hammers in the Hardmode Underground Corruption, the Enchanted Swords in the Underground Hallow, and the Crimson axes in the Hardmode Underground Crimson, but the Cursed Skulls are a quicker way to obtain it. Bezoar: This item is obtained from hornets in the Underground Jungle. 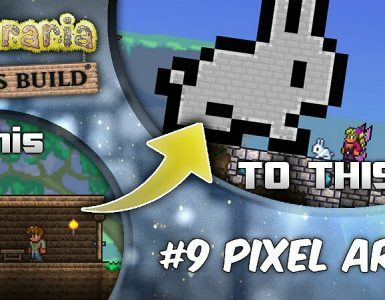 With all the time you’ll spend in the jungle, especially in Hardmode, you’ll get multiple of them without even trying. Each of the Hardmode components is pretty straightforward. It’ll have a 1% chance of dropping from certain enemies, 2% in Expert Mode. 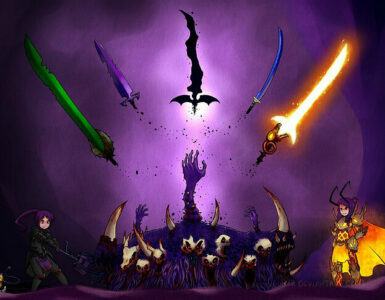 Armor Polish: obtained from Blue Armored Bones and Armored Skeletons. You’ll get this if you spend enough time underground. Vitamins: Drops from Corruptors in the Corruption and Floaty Grosses in the Crimson. If you don’t have this yet, don’t destroy the Corruption/Crimson, as that will destroy your chances if getting it. If you disregarded my advice and destroyed the Corruption/Crimson anyway, you can bring it back with purple/red solution obtained from the Steapunker during a Blood Moon, or with Corrupt/Crimson Seeds from the Eye of Cthulhu. Megaphone: Obtained from Pixies, Green Jellyfish, and Dark Mummies. Note that this item has half the drop chance of the other items. The quickest way to get it is to fight a lot of enemies in the Hallow, as Pixies are everywhere in the Hallow. Adhesive Bandage: Obtained from Rusty Armored Bones, Werewolves, and Angler Fish. The easiest way to get this is to spend every full moon nonstop killing enemies until you get it. Fast Clock: Obtained from Mummies, Pixies, and Wraiths. The easiest way to get this is to either kill enemies in the Hallow like with the Megaphone, or smash a lot of altars. However, I don’t recommend the latter method, as smashing altars adds more Corruption/Crimson to your world. Trifold Map: Obtained from Clowns, Light Mummies, and Giant Bats. You’ll get this if you spend enough time underground, as Giant Bats appear all over the place. Blindfold: Obtained from Corrupt Slimes, Slimelings, and Dark Mummies. You’ll get this if you spend enough time in the Corruption. This item is significantly harder to obtain in Crimson worlds, as Dark Mummies will be the only way to get them. 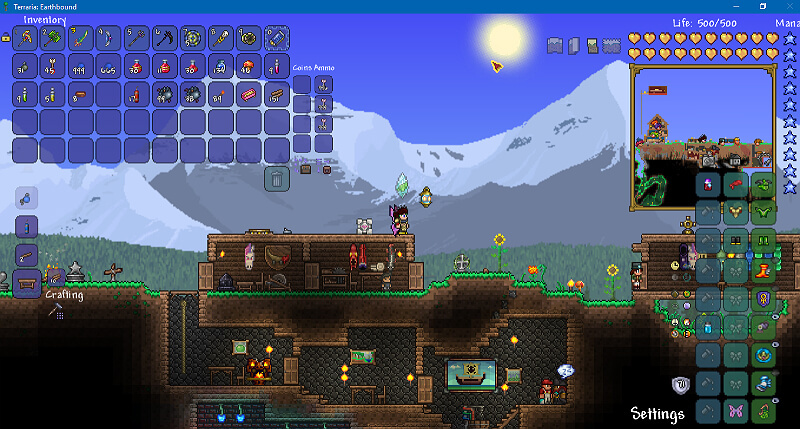 If you have a Crimson world, use a Clentaminator with red solution on a desert, then farm Dark mummies until you get it. Finally, you have obtained all 11 ingredients. 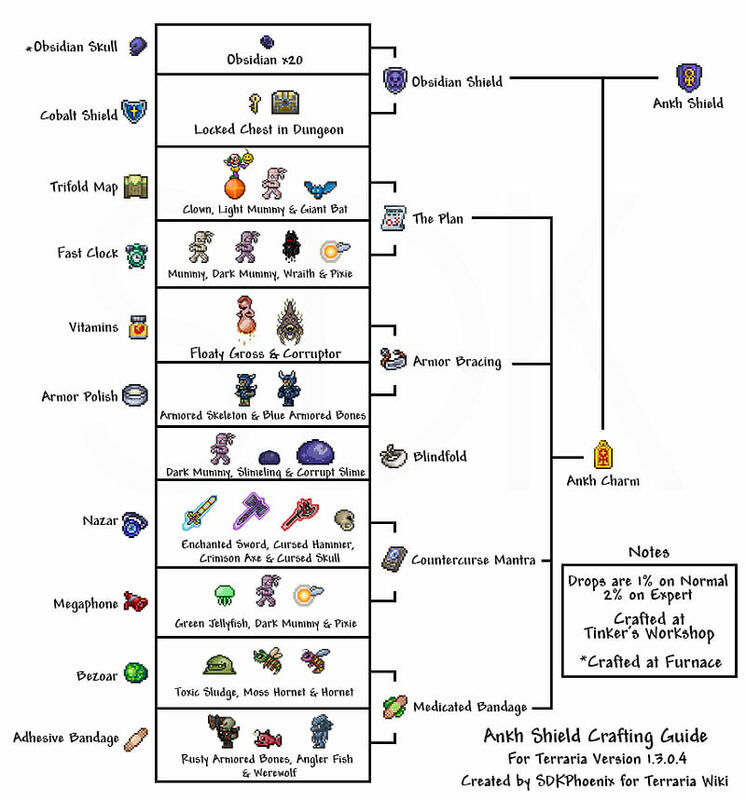 Before you can craft the Ankh Shield, however, you must craft the components.